© Jersey JJ via Flickr. View the Crater Lake photo gallery for more images! On a clear summer day, the water in Crater Lake is such a deep blue many have said it looks like ink. With stunning cliffs towering over 2,000 feet above, the lake is tranquil, stunning, and a must-see for all who find beauty in the outdoors. The lake was formed when Mount Mazama – a dormant volcano - erupted in about 5700 B.C. Eventually rain and snow accumulated and formed a lake 1,900 feet deep – the deepest lake in the United States. Around the lake grew wildflowers, pine, fir, and hemlock leading to the return of an active ecosystem. Black bears, bobcats, deer, eagles, and hawks soon returned and are always exciting to see. Crater Lake is a gorgeous destination with a lot to offer visitors. With 100 miles of trails, stunning scenery, and active wildlife, this national park should be visited by all. Local Native Americans witnessed the collapse of Mount Mazama and kept the event alive in their legends. The legend talks about two Chiefs, Llao of the Below World and Skell of the Above World, who engage in a battle which ended up destroying Llao's home, Mt. Mazama. That battle was witnessed in the eruption of Mt. Mazama and the creation of Crater Lake. The first known European Americans to visit the lake were those looking for gold in the 1850's. Later, man named William Gladstone Steel took a deep interest in Carter Lake. A native of Ohio, he campaigned Congress for 17 years to designate the area as a national park. In 1886, Steel and geologists organized a United States Geological Survey expedition to study the lake. Steel is known by many as the father of Crater Lake National Park. 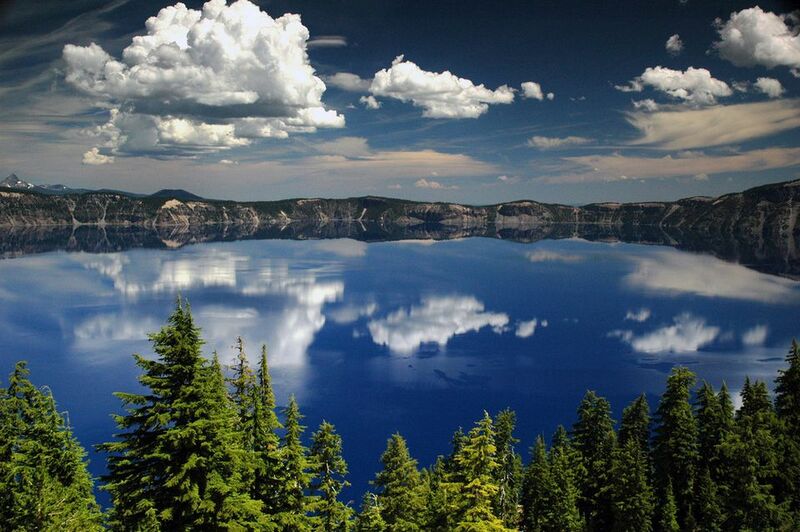 Crater Lake National Park was established May 22, 1902 by President Theodore Roosevelt. For the best and most colorful view of the lake, plan a trip during summer. Keep in mind the drive around the lake usually closes in October due to snow. But those who enjoy snow and cross-contry skiing may enjoy a trip in the winter. Also, late July and early August are peak wildflower months. Major airports are located in Medford and Klamath Falls. (Find Flights) From Medford, the park can be reached on Oreg. 62 and is about 85 miles away. You can enter the park from the south – Klamath Falls - from Oreg. 62, or from the north on Oreg. 138. A standard seven day pass for a car is $15; pedestrians, motorcycles, and bicyclists pay $10. Annual and standard park passes may also be used to waive the entrance fee. Rim Drive: This scenic drive circles Crater Lake providing more than 25 amazing overlooks and nice spots to picnic. A few great overlooks are Hillman Peak, Wizard Island, and Discovery Point. Steel Bay: Visit the commemoration of William Gladstone Steel who helped establish the national park. Phantom Ship: A 160-foot high island consisting of 400,000 year-old lava flows. The Pinnacles: Spires of hardened volcanic ash create a stunning scenery. Godfrey Glen Trail: An easy one-mile hike that leads through forest that developed on a flow of pumice and ash. Mount Scott Trail: Perhaps the most popular trail in the park, the trail ascends 2.5 miles to the park's highest point. Wizard Island Summit Trail: Less than a mile to the island, the trail is full of hemlock, red fir, wildflowers leading to the inside of the 90-foot-deep caldera. Two campgrounds are located within the park, both with 14-day limits. Lost Creek is open mid-July to late September while Mazama is open late-June to mid-October. Both are first come, first served. Overnight backpacking is also permitted in the park, but a permit is required. Permits are free and may be obtained at the Steel Information Center, the Rim Village Visitor Center, and on the Pacific Crest Trail. Inside the park, check out Rim Village/Crater Lake Lodge which offers 71 units that vary in price. Or visit Mazama Village Motor Inn which offers 40 units from early June to mid-October. Other hotels, motels, and inns are available outside the park. Diamond Lake Resort, located in Diamond Lake, offers 92 units, 42 with kitchenettes. Chiloquin offers many affordable accommodations. Melita's Motel offers 14 units as well as 20 RV hookups. Oregon Caves National Monument: Located about 150 miles away from Crater Lake National Park is an underground treasure. Guided tours are available showcasing the “Marble Halls of Oregon” which were formed by groundwater dissolving marble bedrock. Open mid-March through November, the monument may be contacted at 541-592-2100. Rogue River National Forest: This national forest is located in Medford, only 85 miles from Crater Lake National Park, and highlights sugar pines and Douglas firs. The forest contains six wilderness areas, many lakes, and a portion of the Pacific Crest Trail. Activities include hiking, boating, fishing, horseback riding, scenic drives, camping, winter and water sports. Call 541-858-2200 for ore information. Lava Beds National Monument: Rugged terrain, lava-tube caves, and cinder cones sum up this national monument. The area is a fantastic spot for spring and fall bird-watching. Other activities include hiking, camping, and summer tours. Open year-round, the monument may be reached at 530-667-2282.